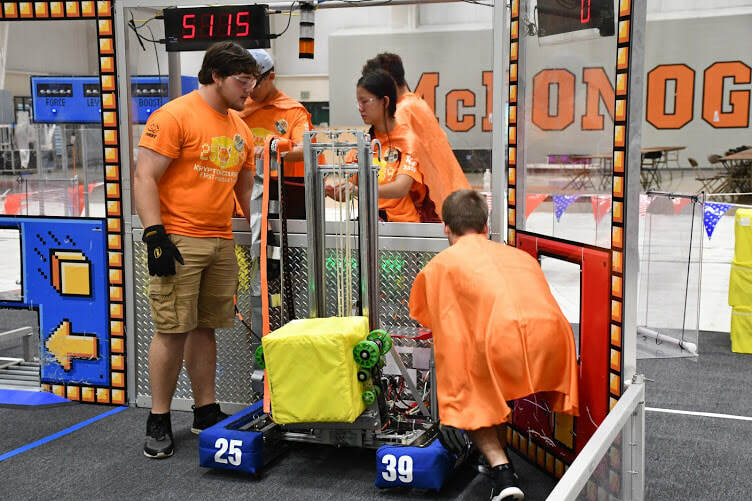 This weekend, the Krypton Cougars-the local FIRST robotics team-got up early on Saturday, and on four hours of sleep, drove down to McDonogh High School to participate in the 12th annual “Battle o’ Baltimore”. The small portion of the team of 11 members and 4 mentors got to the high school around 7 in the morning. After unloading quickly, they checked into the robotics competition for the first time. The Team went to the pit and immediately prepared for pre-match practices. The Cougars pushed through the practice matches, and before they knew it, they were participating in Match #1. Team 2539 allied with 4505 and 1629 won 418-91. The Team was immediately placed in 1st. The Krypton Cougars after that participated in 5 more qualification matches. In match 21 the Krypton Cougars were allied with neighboring team TechFire 225, from York PA and 3389, and working together, won the match with a score of 468-259. In the final match of the day though, the Cougars were placed against 225, and sadly lost 237-360, but the match became frighteningly close at multiple points. In the qualification matches today the Krypton Cougar’s autonomous (the section when the robot is controlled by code) worked on and off, but for the most part, very well. The Cougars ended the qualification matches in 4th place. When it came time for alliance selection the Team was the first-pick for the #1 Alliance, with TechFire 225 as captain and the impressive rookie team, 9999-The RoboCubs, as the Alliance’s last pick. After a lunch, the Team went straight back into the pits, and prepared for the first quarterfinal match. They cruised through their first and second quarterfinals match against Alliance 8, made up of teams 6239, 5945, and 4242. Match 1 ended with Team 2539’s auto working as well, and winning the match with a score of 505-196. The second match ended up as another victory with a score of 481-300. The next match the Krypton Cougars took place in was the Semifinals, match 1. Going up against teams 614, 5830, and 5724, the auto started out successful for 225 and 2539, with 2539 on the switch, and 225 on the scale. Team 9999 did manage to cross the auto line, but not score. With an ending score of 447 to 212, the alliances went up again, with the Red Alliance(2539) winning 390-159. Finally, the Finals rolled around, and the #1 Alliance went against the #2 Alliance, made up of teams 1629, 686, and 3389. When the first match started out, auto ended up being successful on both sides minus 9999 and 3389, but they both did manage to cross the auto-line, earning points. With Team 2539 on switch and scale, Team 225 on full scale, and 9999 on vault, a battle for control of the scale raged on. Team 686 though did not plan on letting the #1 Alliance climb. They blocked and rammed, but the Krypton Cougars managed to escape. The match ended with 225 climbing, 2539 on the platform, and 9999 scoring a levitate. The Red Alliance won the match 473-168. Finally, the last match started. 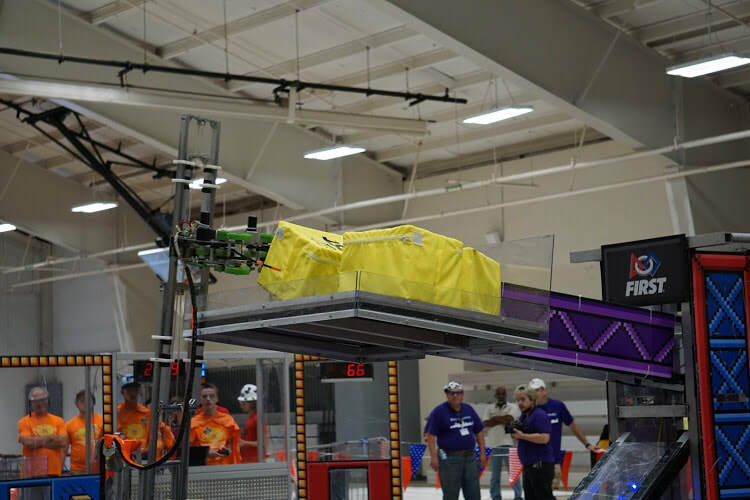 The auto started out the same as the previous match for the #1 Alliance-all robots crossing the auto line. But as soon as tele-op started, and TechFire went into the Blue Alliance territory, Team 1629 rammed 225, almost tipping them over. But 225 managed to stay upright, but was pushed into the blue Alliance’s null territory, giving points to the blue alliance. An intense battle for the scale went on, with each alliance controlling their own switch. At one point, the Blue Alliance was losing cubes, and 2539’s cube stacking expertise payed off. The Red Alliance took control of the scale, and went on to climb. With a levitate for 9999, the duo of 225 and 2539 pulled off the famous double climb. With only 1629 climbing, the #1 Alliance was declared victorious, with a score of 435-349. The Krypton Cougars had won at their first time at the Battle O’ Baltimore. This would become the team's second win in a row, after winning Midknight Mayhem in June, with alliance partners 225, and 11. 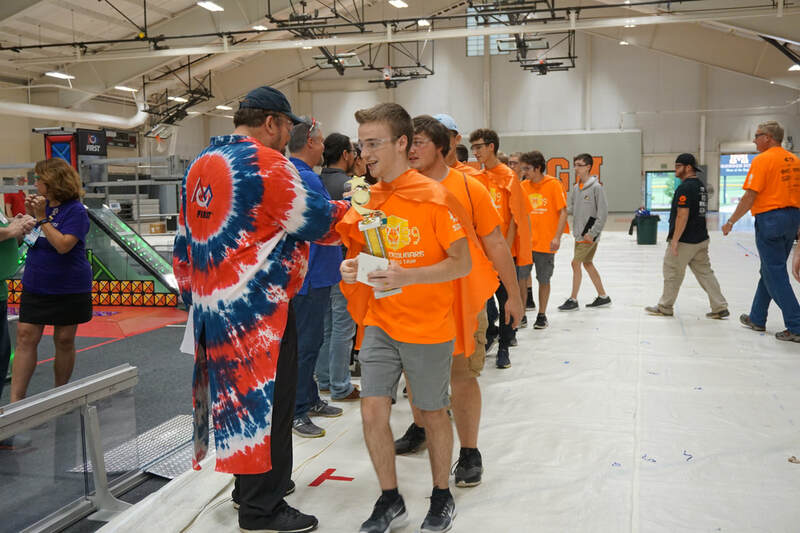 To make it more impressive, Team 2539 and Team 225 were from the Mid-Atlantic District, while everyone else was from the Chesapeake District, as this was a Chesapeake District event.